Our sparkling Deco Diamond Award features diamond-shaped optical crystal that is sure to impress the recipient and attendees at your next event. It comes in three sizes. The Deep Plaque is a simple twist on the Light Plaque. The Deep Plaque, which is rounded at the edges, is made from a chocolate stained rubber wood. It can be hung on a wall like a traditional plaque award, or self-standing with the help of a removable dowel. Your plaque can be accented with a gold or silver plate. It can also hang or stand horizontally or vertically. It is an excellent choice to commemorate any type of certificate of completion. 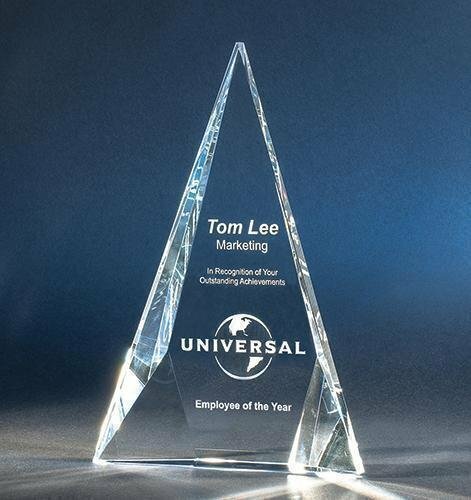 Clear optical crystal standalone award featuring a unique triangle shape. 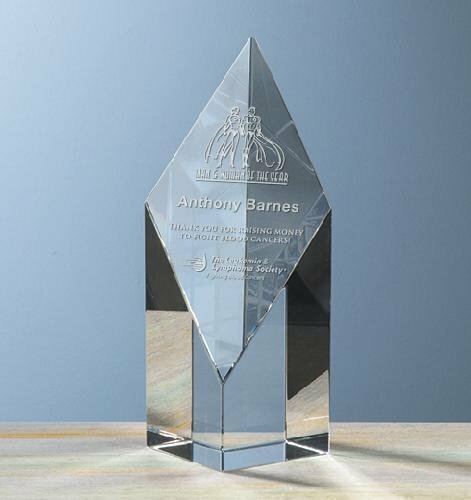 Large award features ample etch area for company logo and copy.